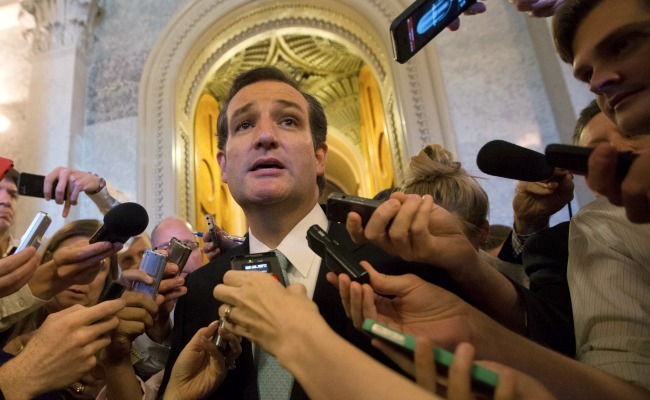 How Unpopular Is Ted Cruz Right Now? Republican pushback against the junior senator from Texas is a thing to behold. Watching the pushback against Senator Ted Cruz right now is like watching a group of kids who have been in thrall to a bully suddenly wake up to who he is and start working to cut him down to size. Republican members of Congress who were once his allies have begun to turn on a man who has become an outsize figure in their party since winning office less than one year ago. “As soon as we listed Ted Cruz as our featured guest this week, I got unsolicited research and questions, not from Democrats but from top Republicans, to hammer Cruz,” Fox News Sunday host Chris Wallace said on his show. "Why are Republicans so angry at Ted Cruz?" The dynamics of the last-ditch effort to try to derail the implementation of the health-insurance exchanges set to open for enrollment on October 1 have pitted House Republicans against Senate ones and all but ensured Republicans will take the blame for any government shutdown, since they are the ones who will have to cause it or else watch Obamacare funding go through. The congressional dynamics at play here are complicated and hard to communicate to a general public that's not versed in parliamentary procedure, leaving Cruz and Lee calling on voters to call their senators to ask them to block "cloture," or limiting debate on the budget bill in the Senate. Except it's not even a proper budget bill but a continuing resolution to maintain current levels of spending for the next two and a half months. Calling for GOP senators to "in effect, filibuster the House-passed continuing resolution in the Senate," as Roll Call described it, could shut down the government when the fiscal year ends on September 30 at midnight, if the Senate cannot pass a budgetary extension before then. "If you caught Sens. Ted Cruz (R-Tex.) or Mike Lee (R-Utah) on the Sunday talk shows, you would quickly realize that these two have absolutely no idea what they are doing," concluded conservative columnist Jennifer Rubin. "Lee’s and Cruz’s insistence that they are the ones 'fighting' is belied by the facts. They are actually intent on running into a concrete wall again and again to prove their political machismo. For many Republicans this isn’t bravery but stupidity." Not only that, what Cruz and others are calling "defunding Obamacare" won't actually end it, as the more than three-year-old Affordable Care Act is already partially implemented, has been upheld by the Supreme Court, and will remain in effect, slowly changing the health-care financing system nationwide. "It's not honest to call on Republicans to defund Obamacare because it's not achievable," observed former George W. Bush communication director Nicolle Wallace on MSNBC's Morning Joe. Ted Cruz blew his first big shot in politics. Back in 2000, he had scored a plum assignment working in the policy shop of George W. Bush's Austin-based presidential campaign. He distinguished himself in the weeks after the election, serving on the legal team that helped Bush win the Florida recount and, by extension, the White House. He seemed destined for a meaty job in the new administration. But Cruz's personal style earned him many detractors in BushWorld. He was infamous for firing off mundane work e-mails in the middle of the night — it happened so often that some in the Bush campaign suspected him of writing them ahead of time and programming his computer to send while he was asleep. He was also known for dispatching regular updates on his accomplishments that one recipient likened to "the cards people send about their families at Christmas, except Ted's were only about him and were more frequent." When it came time to divvy up the spoils of victory, many of Cruz's campaign colleagues headed to the White House; Cruz went to Washington, too — but he was exiled to the outer Siberia of the Federal Trade Commission. It was the continuation of a pattern of being self-promoting and self-interested to the point of being uncollegial, Zengerle observes. "As a law student at Harvard, he refused to study with anyone who hadn't been an undergrad at Harvard, Princeton, or Yale," he reported. There's one group happy with Cruz's anti-Obamacare performance: The activists who have been working for years to try to defund, replace, or repeal the president's law to expand the availability of health insurance. More than 1.5 million have signed on to Cruz's "Don't Fund It" petition.